“Voters responded very positively. I also had conversations with people who may not have agreed completely with the Invest for Ed initiative but after I talked to them and explained to them my personal walk of life and some of the experiences my child had growing up, I suddenly saw this change in people who said ‘You know what? I really appreciate that you talked to me and explained your personal story, because now I get it,’ ” Schmid-Riggins said. 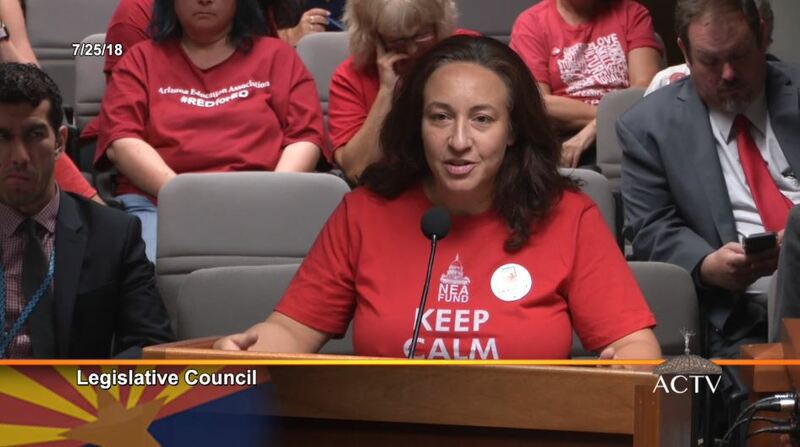 “We need to make sure that our schools are properly funded, our students are taken care of and that teachers have the resources to do their job in the most effective way,” Cobos said. According to the Joint Legislative Budget Committee fiscal impact analysis and ballot proposition summary presented to the Legislative Council on Wednesday afternoon, the Invest in Ed initiative would create starting Jan. 1, 2019 an 8% income tax rate for single taxpayers with $250,001 to $500,000 in taxable income and for married persons with $500,001 to $1 million in taxable income as well as a 9% income tax rate for single taxpayers with $500,001 or more in taxable income and for married persons with $1,000,001 or more in taxable income. That would put an estimated $650 million to $750 million into the Classroom Site Fund in the first full year of implementation and those monies would be distributed to school districts and charter schools, according to the JLBC analysis. The actual amount would depend on factors including whether high-income taxpayers leave or shift income out of state because of the new tax rates, and whether higher tax rates might reduce business investment, the JLBC said. Knox also noted that she did not have access to the amendments being proposed, although she wished she did. The Legislative Council discussed how the ballot summary should be worded and offered amendments to explain who would be affected, the magnitude of the increases from the current 4.54% to 8% income tax rate and 4.54% to 9% income tax rate, and whether the ballot proposition should mention small businesses, which are affected, or C corporations, which are not. “Once we determine what information needs to be there, we need to determine how it should be presented,” said House Speaker J.D. Mesnard. Dana Wolfe Naimark, president and CEO of Childrens Action Alliance, said it’s important for voters to have clear impartial information to make a good decision in November. 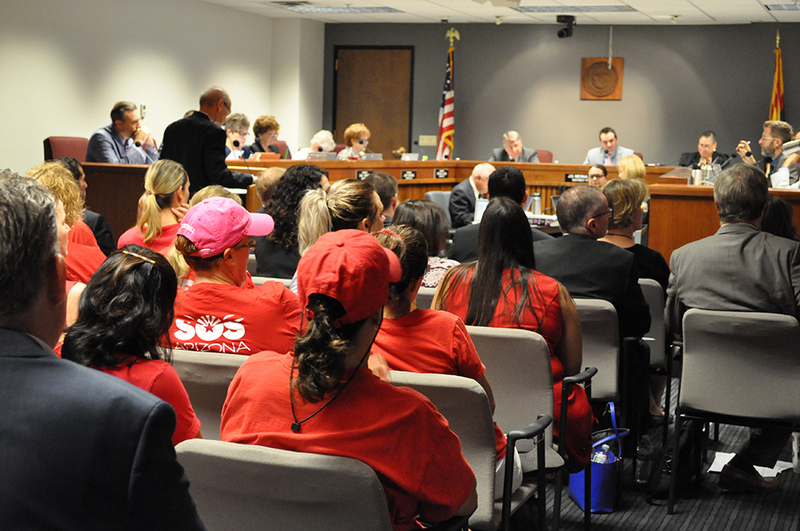 Jaime Molera, chairman of Arizonans for Great Schools and a Strong Economy, a committee created by the Arizona Chamber of Commerce and Industry to oppose the Invest in Ed initiative, said he supported the proposed ballot language with a few clarifications. The group filed a lawsuit earlier this week to block the proposition from the ballot. 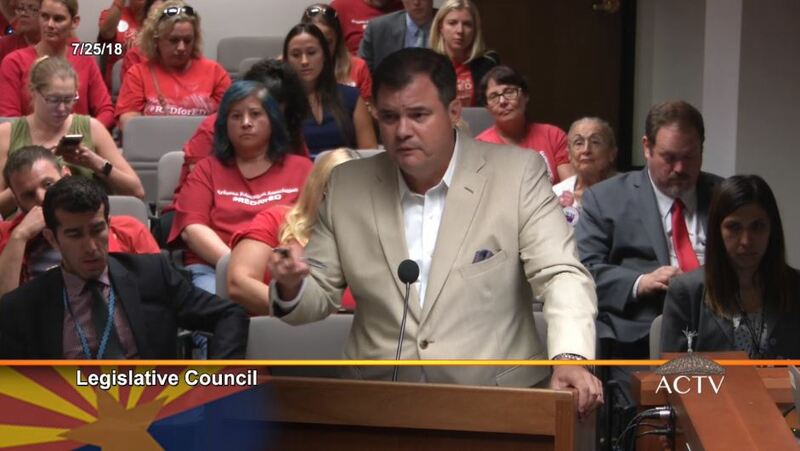 “One, would be that we believe that there needs to be on what the percentages of increases actually are so people can see that this has been termed to be just a 3.4% and a 4.4% respectively increase, when it’s in fact a 76% and 98% increase respectively,” said Molera, a former Arizona Superintendent of Public Instruction. Molera also said that there should be clarifying language that LLC and S corp business organizations are affected by this initiative, while corporations are not taxed by this initiative. Also, Molera asked that there be some proposed language on the definition of teacher. “Today’s initiative is around the tax bill, and I thought it was of paramount importance to speak up and talk about transparency and information that should be included so voters can make an informed decision,” Del Palacio said. Kathy Hoffman, an educator and candidate for state superintendent of public instruction, said she was here to make sure that the language that appears on the ballot is understandable to voters. “I’ve worked my entire career in our public schools, and I’ve seen the effects of the severe under-funding that has been affecting our schools for the past 20 years, so it is critically important to see that our schools have the opportunity receive a big burst in funding to make sure that our schools have the resources that they need for our students to be successful,” Hoffman said. Sustainable education funding is important whether you have children in the school system now or your children have grown up, Schmid-Riggins said. “We are all a community, and if our children are hurting then our community is hurting,” Schmid-Riggins said. At around 4:30 p.m., the Legislative Council voted 8 to 4 with 2 members abstaining to approve the amended ballot measure language and fiscal analysis.